The name espresso is Italian in origin. It was first coined around 1900 and, loosely translated, means a cup of coffee brewed expressly for you. Today, you will often find that people incorrectly pronounce or spell it "expresso". Espresso can be very confusing. Is it a bitter concentrated shot of caffeine? Where did it originate? Can you use sweeteners? What is the creamy froth on top? How should you drink it? Part of the confusion is due to improperly prepared espresso. Correctly brewed espresso is made using a pump-driven or lever operated espresso machine. It is an art and a science. So what makes a true espresso? No. Inaccurate marketing and erroneous word of mouth have given many people the impression that the type of bean determines whether the brew is espresso or not. This is not true. Any type of coffee bean can be used to make good espresso coffee. No. Although there are blends designed specifically for espresso, the blend does not make it espresso. The pursuit of the perfect blend for making espresso coffee has led to this common misconception. Some roasters might even argue that you can only make a good espresso with the right blend. 1st in Coffee offers a variety of espresso blends from illy, Lavazza and Segafredo. We even have our own espresso blend. No. Popular thought might lead you to believe that espresso must be an extremely dark roast; however the espresso roast varies from region to region. In California, you would be most likely to encounter a dark or "French" roast. On the east coast of the US, a light roast is often preferred. And in Northern Italy, a medium roast is generally used. Any roast can be used to make good espresso. It is entirely a matter of taste. No. There are machines out there labeled as "espresso machines" that aren't really true espresso machines. These machines are generally electric "moka" style machines that rely on steam pressure to force water through the ground coffee. Steam pressure is only capable of producing up to 1.5 BAR or 50 PSI of pressure. A true espresso machine must produce a minimum pressure of 9 BAR or 135 PSI (pounds per square inch) to force the water through a bed of finely ground and compacted ground coffee. The steam driven moka pots are often sold in major department stores for $75 or less. They usually include a 4 cup carafe. True espresso machines are pump-driven or lever operated. Espresso coffee is a small 1 to 2 oz. shot of pressure-brewed coffee using between 6.5 and 7.5 grams (about 1 Tablespoon) of finely ground coffee. Brewing takes about 25 to 30 seconds. 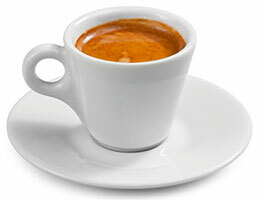 Properly brewed, an espresso will feature a layer of rich dark golden cream, called crema on the surface. This crema is one indictor of a quality espresso. Making a great espresso is truly an art as well as a science. Drinking an espresso coffee can also be an art. In an Italian café, you might witness patrons breathing in the aroma as they hold the cup and saucer, and then drinking the entire beverage in 3 or 4 quick gulps. The ritual is finished by firmly but gently tapping the cup back onto the saucer. Adding sugar to the espresso is an accepted practice in Italy, and there is no shame in adding sugar to your beverage. But a truly great espresso is a joy to drink without any additives. You can then taste and appreciate the essence of the espresso more completely. And so you can begin to understand modern espresso, how to prepare it properly, and the traditions behind this wonderful beverage. The core of the espresso is the coffee bean. The coffee bean is from the heart of the coffee berry. These coffee berries grow on trees that thrive in tropical climates and at elevations between 2000 and 6000 feet above sea level. All coffee berries are hand picked or mechanically picked. Hand picked berries are nearly always the best due to better quality assurance. This harvesting method is frequently a factor in the higher cost of premium beans. Berries are then processed and bagged in order to "bring them to market". There are two beans, or seeds, in each berry. The coffee is shipped in this un-roasted state since the un-roasted, or "green", coffee can be kept for much longer than roasted beans, up to two years under the right storage conditions. All coffee is eventually roasted. Really good coffee is roasted just before brewing, since the average shelf life of roasted coffee beans is only two weeks. After that, the quality of the beans begins to go downhill quickly. Taste and aroma can fade rapidly. Like so many other aspects of coffee, and espresso in particular, good roasting is also an art with a firm basis in science. Beans are roasted in rotating drums at approximately 450F degrees for 10 to 20 minutes. To accommodate the particular roasting machine and the roaster's preference, the roasting time and temperature may be adjusted. This adjustment is known as the "roasting profile". After roasting, the beans will need to rest for 12 to 36 hours for degassing. The various gases produced by the roasting process are released in this resting stage. The roasting process causes a variety of chemical changes in the coffee bean. Roasted coffee beans contain 1500 chemical substances that interact to create the distinctive flavor of your coffee. And so we can begin to appreciate that this seemingly simple drink is really very complex. Espresso coffee has been around for quite awhile. Luigi Bezzera patented the first steam driven espresso machine in 1901. He called his creation the Tipo Gigante. In 1905, Desidero Pavoni bought Bezzera's patent and brought it to market as the Pavoni Ideale. These early machines were much like the modern moka style brewer. The modern espresso machine made its debut in 1947, when Gaggia revolutionized the industry with the piston lever Crema Caffe machine. This was the first of the marvelous machines capable of consistently producing the high pressures necessary to create espresso. The Gaggia Crema Caffe was ideal for commercial use due to the ease of its operation and reasonable price. Italy's espresso culture was truly born. By the year 2000, espresso machines have advance to the point where a real cappuccino can be prepared at the touch of a button, click here for details on Jura super automatic espresso coffee centers. Some of our most popular espresso machines include the Automatic Jura Micro 1, the Version 4 Rancilio Silvia, and our most special One Touch Cappuccino Machine, the Jura GIGA 5.